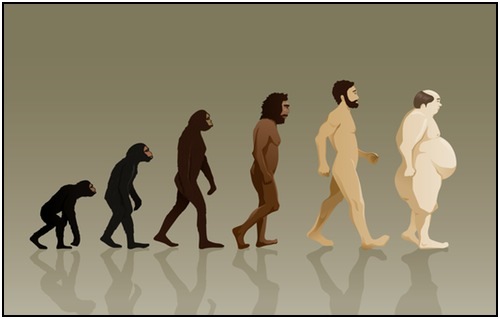 Evolutionary Fitness (EF) is the original name that Arthur (Art) De Vany gave to his style of exercise and diet. EF is a way of exercise that uses the body in the manner that our hunter-gatherer ancestors did - which happens to build strength, speed, and a ripped physique. I understand and respect the science underlying it. First, What Is Evolutionary Fitness? EF is a style of exercise designed to work with our genes to bring out peak strength and ability. This will also make us look like the second to last guy in the picture below, and not like chubby at the end. Our hunter-gatherer ancestors were strong, fast, and didn't have the chronic health problems associated with a 'modern' or 'western' lifestyle and diet. The few tribes that have survived to the present day show these characteristics. EF allows you to emulate the good points of their lifestyle — yet avoid those pesky ice ages. These are the most important components in evolutionary fitness. There are many other finer points, but the six ideas listed above are the essentials. Another important component is integrating evolutionary fitness with the paleo diet. They were made to be done together, and doing one without the other just doesn't give you the same results. I've written at lot about intermittent fasting, and the way it's used in EF is very doable. If you're trying to lose weight, skip dinner once a week so you have a mini-fast until breakfast. Since you're already eating a paleo style diet (mostly vegetables and meat), you will probably be eating fewer calories. And that mini-fast once a week will also accelerate your fat loss. The key is to avoid going chronically hungry. If you diet down, you're chronically decreasing your calories. This leads to diet relapses, binging, loss of lean body mass, and a host of bad things. Eating a healthy paleo style diet with occasional periods of starvation is easier on your body. It's a more sustainable way of achieving a better body composition. Basically, workout when you're hungry. First thing in the morning? A great time to train! Fasted weight lifting (or other exercise) burns fat, and also trains you not to rely on dietary sugar for your fuel. This will help you break the sugar-crash-sugar-crash cycle of eating that I see in so many people. Also, there's some preliminary evidence that working out in a fasted state puts more strain on your body and, hence, forces it to work harder to adapt after the workout. Martin Berkhan at LeanGains.com advocates working out in a fasted state too, which helps him stay lean and build muscle. There's more and more evidence to show that brief, intense weight training workouts produce dramatic results for increasing muscle mass and strength. This is used in high intensity interval (HIIT) training, and Doug McGuff advocates this approach in his Body By Science book and workout routines (a doctor and exercise expert who I really admire). Think of exercise like walking. You walk around all day, but that doesn't build strength. It's the hardest things you do (walking up the stairs, squats, jumping, etc.) that actually increase your strength. Art backs a 15-8-4 sequence for his workouts. 15 Reps with a light weight, 8 with medium weight, and 4 at your max weight. All done with no rests in between, and never going to failure. So go to the gym, do a few really hard things, and get out. For starters, do you think your ancestors did something really difficult and then had a sugary-protein shake? No. From a scientific standpoint, brief workouts release lots of growth hormone. And insulin triggered by a sugary workout drink can push those levels of growth hormone right down again. A sugary post-workout drink doesn't always tank your growth hormone - there are studies going both ways. And bodybuilders drink post-workout protein shakes religiously and do put on muscle. Just keep in mind that EF works primarily to strengthen your muscles, not to put on lots more muscle mass. Negatives (also called eccentrics) are when you lower a weight that you don't have the strength to lift (yet). You just do the negative part of the movement. Using negatives, you can work with a lot more weight than you can with conventional lifting. Like, 40% more! Also, there is some evidence that doing negatives causes increased expression of your fast twitch type two muscle fiber. That's the stuff that helps you move forcefully at lightning speed. Negatives are also very safe, since you're just lowering the weight. You don't have the speed and accompanying lack of control, which keeps you from hurting yourself. Art brings a wonderful sense of Zen into his ideas about evolutionary fitness. He teaches that you shouldn't be overly focused on reps, sets, or necessarily making progress at every workout. While that viewpoint might not appeal to you if you are particularly young and crazy, it's a great mentality to bring to your training long-term. It will keep you training for the fun of it. I do evolutionary fitness because it's relatively simple, and there's lots of evidence for it. On workout days I'll usually skip breakfast and just workout in the morning, and then go lifting in the afternoon or early evening when I get really hungry. Then I go home and have a good meal! No shakes, but real cooking - which sometimes takes a bit of time. I don't worry about eating within a time window after my workout. I put negatives at the end of my weight lifting sets, and do a brief workout. And if I didn't make progress, I get some rest and come back in a few days or a week. I know I'll get stronger if I just stick with it, and I give it my all when I'm training. I also do some sprints up a hill near my home. Sprint up, walk down several times, and then switch it up and sprint down to train myself to go faster. It's a more relaxed mentality to bring to your weight training and exercise. It makes your life more enjoyable. Try it. • Click here to leave 'How I Practice Evolutionary Fitness' & go back to the Home-page! 1. De Vany, Arthur. 2011. The New Evolution Diet: What Our Paleolithic Ancestors Can Teach Us About Weight Loss, Fitness, And Aging. Emmaus, Pa: Rodale. Pp. 94. 2. Tannerstedt et al. Maximal lengthening contractions induce different signaling responses in the type I and type II fibers of human skeletal muscle. Journal of Applied Physiology (2009) vol. 106 (4) pp. 1412-1418.